I just found this picture in iPhoto. I've posted a similar picture before, but this one explains better what actually happens when exposing a film positive and making a stencil on to light sensitive emulsion. When doing the screenprints for the landscape series I did everything myself, naturally (who else would do it?) and made many mistakes -- but was startled and brought down to earth by my tutor, who said that in his day they had technicians to do this sort of thing. This was deflationary, for sure, but it seems worthwhile to me to have a total grasp of the process through doing it myself. The photo shows how the lamp is rigged up at a specific height above the screen -- books can be added or taken away under the board as necessary to get the exact distance, it's a very flexible set-up. Also worth noting, there's a sheet of black paper under the screen frame to minimize reflected light, and a black cloth along the back to block light coming in under the door. 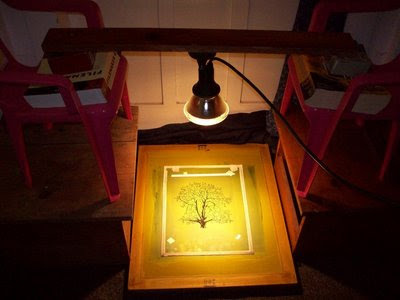 The screen is placed on the black paper, fabric side up; the film positive is placed on top of the fabric, and a sheet of glass is placed on top of that to ensure good contact; and then the light is turned on for six minutes. You can just about see the green light-sensitive emulsion on the yellow screen fabric. For the larger version of the tree I got a film positive made from my jpeg at Print on Demand on Tragarete Road. This is it, on Picasa, all six pictures. Click one to see at a bigger size.